Since 1997, I have been developing my own way of practicing, making, and performing dance. In this work, I am and have been deeply influenced by experiences and individuals named here. Kimerer is available to give lectures, workshops, and performances. An original concert of music and dance featuring song/poems based on Kimerer's book, Why We Dance. 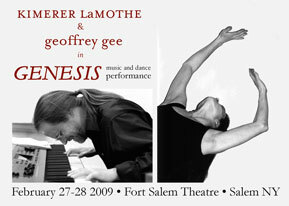 Kimerer dances to Geoffrey's improvisations in the LaMothe Gee Family Concert. 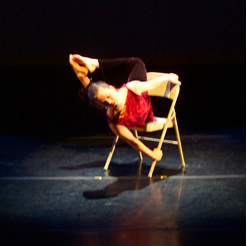 This solo dance piece explores the influence of sitting and writing on our experience of ourselves and our experiences of the divine. The score features words by Descartes, Kant, Nietzsche, and Martha Graham, and original music by Geoffrey Gee. An hour-long movement meditation on the ongoing act of creation featuring an original score by Geoffrey Gee. The five parts of Genesis explore the kinetic shapes of the human journey: birth, longing, sadness, despair, liberation, and the return of joy. It is a dance deeply inspired by Graham who wrote, "How does it all begin? I suppose it never begins. It just continues. Life-Generations-Dancing."